After the presentation of the MFI ACAD in Palestinian Territories, we now present you our new partner in Jordan : MFW (Microfund for Women)! Jordan, known as a land of contrasts between the very fertile Jordan Valley and canyons in the desert, is bordered by influential countries like Israel, Palestinian Territories, Syria, Iraq and Saudi Arabia Territories. In the last decades, Jordan has benefited of a strong economic and population growth due in part to a major tourist activity. Governed by MFIs in eight levels of performance, the microfinance sector in Jordan is the largest in the Middle East. Strongly present, however, it is close to the saturation level. Located in the capital of Jordan, Amman, MFW (Microfund for Women) provides loans in order to help entrepreneurs, especially women, and enable them to generate income and become involved in social and economic life. MFW, as a private and non profit Microfinance Institution provides services in urban and rural areas through a network of 41 branches. MFW has many regional offices in Jordan and its headquarters are located in Amman. The MFI have, late December, 401 employees and about 56% of them are loan officers. MicroWorld is working with these three branches: Nazzal, Al Nazer and Amman. What are the characteristics of MFW? The particularity of this Microfinance Institution, as its name suggests, is to provide microfinance services to a majority of women to create a more just and equitable society in which they would have more power to break the cycle of poverty and ensure prosperity. Indeed, despite all the efforts made ​​to improve women's rights and their living conditions, in particular with the implementation of a process of quotas at the heart of parliamentary system, gender inequalities are still high in Jordan. What kind of projects are funded by MFW? In March 2012, MFW had 66,587 active clients and an outstanding loan portfolio of 26,550,454 USD. End of 2012, 82% of the micro-entrepreneurs are rural and 18% urban, however, the funded projects are mostly in the commercial sector (84.5%). MFW finance group loans for the biggest part of its loans portfolio (66%), against 34% of individual loans. Across MFW loan portfolio, 97% of micro-entrepreneurs are women, strongly affected by poverty, excluded from the traditional banking system and still widely discriminated in Jordanian society. MFW also differentiate itself from others MFIs in the Middle East because it provides financial services since 2008 in the form of training in relation to markets and programs of awareness. Microfund For Women (MFW) was created in 1994 as a pilot project of the program "Group Guaranteed Lending" initiated by Save the Children in Amman. 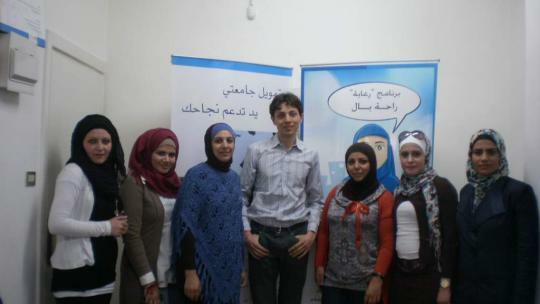 Two years later, this pilot group was transformed into a local NGO "Jordanian Women's Development Society" to provide access to credit facilities to women with limited means. In 1999, Microfund for Women became independent and was transformed into a limited liability company and non-profit. Since then, MFW has intensified its activities and now plays a major role in microfinance in Jordan, coming to the aid of thousands of people, mainly women. The main purpose of MFW is to provide financial and non-financial services to poor entrepreneurs, especially women, to transform their lives to ensure a better quality of life through the development of their own economic activities. MFW also remain committed to become the first Microfinance Institution in Jordan and to focus on local economic development. In 2015, MFW expects to develop its active customer base to more than 110,000 for a portfolio of loans in the order of 36 million U.S. dollars. Last March, the MicroWorld Operations Team went to MFW headquarters to Amman to do an internal audit, to train our local correspondent Najwa Kopti and finalize this very promising collaboration. To see all the pictures of the integration of the MFI in Jordan: click here! "The microfinance revolution is now"